Whether designing aquatic programming for the professional athlete, the "armchair" athlete, or somewhere in between, this course will provide numerous options for improving performance and functional capabilities using creative and carefully developed aquatic exercise. The focus is on formatting for optimum efficiency in relation to a variety of student goals: sports related, recreational activity, or daily function. Participant goals, muscle involvement and equipment interaction are considered, along with movement patterns to improve performance and enhance exercise retention at any level of activity or sport. Describe 3 target groups who would benefit from sport, function, and performance training. Discuss how to incorporate and describe exercises in all three planes for functional fitness, balance, functional upper body challenges, and proprioceptive neuromuscular facilitation (PNF) training in a functional training program. Explain the role of buoyant, weighted, drag, and rubberized equipment use and corresponding muscle actions in functional training. 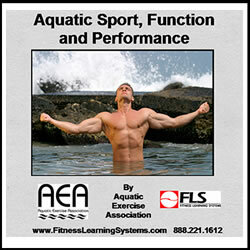 Identify equipment that can be used for functional training in the aquatic environment. Identify the 4 parts of a needs assessment. Discuss the 6 program components for class design in functional training. Identify and describe 14 cardiovascular exercises with variations for sport and performance enhancement. Describe sample programs for 5 types of functional training, and cardiovascular training exercises for nine functional training target groups. Describe marketing strategies for functional training for 5 target groups.